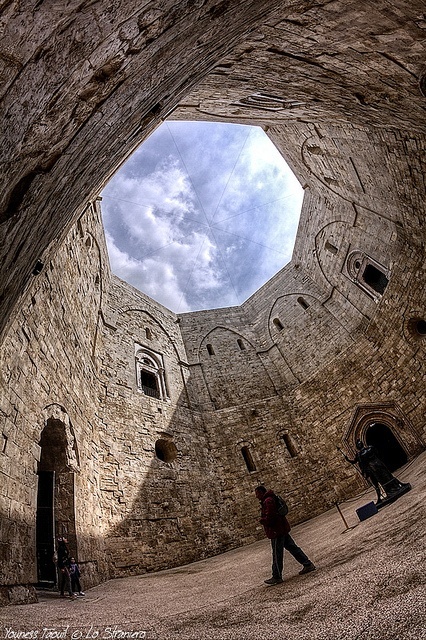 Castel del Monte is a 13th-century citadel and castle situated in Andria in the Apulia region of southeast Italy. It stands on a promontory, where it was constructed during the 1240s by the Emperor Frederick II, who had inherited the lands from his mother Constance of Sicily. In the 18th century, the castle's interior marbles and remaining furnishings were removed. It has neither a moat nor a drawbridge and some considered it never to have been intended as a defensive fortress; however, archaeological work has suggested that it originally had a curtain wall. Described by the Enciclopedia Italiana as "the most fascinating castle built by Frederick II", the site is protected as a World Heritage Site.